Pack Expo in Chicago this year was unlike anything I could have ever imagined. It was, by far, the largest convention that I have ever attended and I can honestly say that everyone looking to mill their own rice should attend this great show. I can also say that you should have some idea of why you are visiting. Anything and everything that you can imagine regarding packaging is there and on display. It can get pretty overwhelming if you don’t know which direction you are heading. From a new visitor’s perspective, here are just a few of the things that I noticed. There’s a robot for that. We laugh at the statement that all of us have heard through advertising claiming that “there’s an app for that.” In the same style and fashion, robots were everywhere on the show floor. From specific processes to sorting out items on a conveyor by size, color, or shape, the robotic technology that was displayed was breathtaking. Metal is the enemy in your package. As a producer, the last thing you want someone to bite down on is a piece of metal coming out of your product. Metal detection is extremely important and must be considered in your packaging line. You need magnets to get ferrous metals such as iron and nickel out of the line, but you also need to address the non ferrous metals. Non ferrous metals are not magnetic and include aluminum, lead, and stainless steel. In order to get non magnetic metals out of your product, you need metal detection equipment. Metal separators are put into the production line to remove those non-ferrous metals from the product flow while x-rays and metal detectors are used to examine the final packaged product. Each component has the ability to remove product with metal in it before being shipped to the end customer. Pre-made pouches or Form, Fill, and Seal? If you are packaging in small bags such as 1 or 2 pound pouches, or even pillows (like you traditionally see rice in), there are two different bagging options. The first is pre-made pouches. With a pre-made pouch, you send all of your bag artwork to a printer who prints all of your material on the front and the back of each bag and then sends it to you. It is your job, at that point, to fill the bag with your product and close the package for final sale. If you are looking at form, fill, and seal, all of your artwork is printed on a giant roll of film. The form, fill, and seal machine will then automatically form the bag as you’ve designed, fill it with your final product, and then seal it shut for final inspection and delivery. You can imagine that form, fill, and seal would be a more expensive machine, but the printing cost per package is less than pre-formed bags. Labels, Labels, Labels. After packaging your product, whether in pre-made pouches or form, fill, and seal, you still have to put additional information on your packaging such as expiration dates, lot numbers, and bar codes. There are solutions which will print custom information on a label and place it on your package. More impressively even than that, there are laser printers which can print labels on your boxes or packages without any moving parts. If you’ve ever played “now you see it, now you don’t,” it was quite impressive to watch these machines do their work. There are no wrong answers. Truly, there is no right or wrong way of doing things. Your packaging is as significant to you and your operation as your personality. There are traditional ways of packaging certain commodities, but you can break that mold with something new and inventive that will catch your customer’s eye as well. There are solutions that range from the very economical which requires significant human interaction all the way to advanced automated solutions which range in the hundreds of thousands of dollars. You have to pick what’s best for your product, your budget, and your client. Maybe you have a package design that you really like and it’s working well, but want more of a systematic approach to filling them. Or maybe you are starting from scratch and are looking for ideas on how to package your specific product. 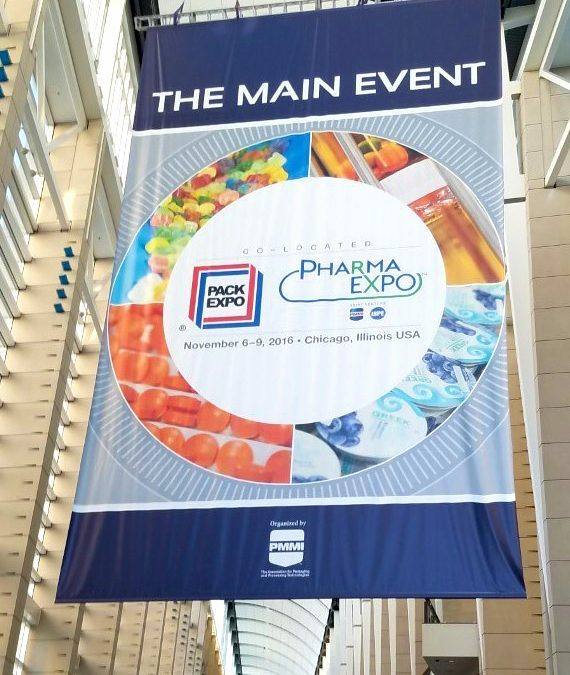 PackExpo has the answers for any and everything you are looking for. I can’t endorse this show enough for everyone looking at their packaging operations. For more information about next year’s show, visit www.packexpointernational.com. And look for examples of what ZaccariaUSA clients are doing with their packages coming soon.